The last moon mission on NASA's current schedule - a small, unmanned spacecraft that will study moon dust and the lunar atmosphere - is scheduled to launch Friday from Wallops Island, Va., elating scientists who study the moon but highlighting political questions about what NASA should do next. The Smart Car-size spacecraft, which NASA calls the Lunar Atmosphere and Dust Environment Explorer, will take 30 days to get into orbit around the moon, spend the next 30 days checking its equipment and proceed with scientific work for 100 days, searching for water molecules in the atmosphere and gathering data about the curious substance known as lunar dust. Then the probe, which goes by the acronym LADEE, will take a death plunge into the rocky surface of the subject it is studying. The results of the scientific program could be helpful in preparing for future manned missions to the moon. Although NASA currently does not have such plans, some members of Congress have called on the space agency to return to the moon rather than pursuing its current space objectives. Although there is wide agreement that NASA should ultimately aim for a manned flight to Mars, that goal is far off. The more immediate plan, which has been criticized on Capitol Hill, is to capture an asteroid and tow it closer to home so astronauts can visit it. But NASA has continued sending unmanned spacecraft to the moon; the coming mission will be the third to go there in five years. Although scientists are excited about what the experiment may yield, they are also concerned about the absence of future moon voyages on NASA's schedule. "If you're going to fly this mission with the goal of understanding the atmosphere and how dust might affect future human missions, and you don't have the future human missions, then part of the reason for the mission disappears," said Dr. David Kring, senior staff scientist at the Lunar and Planetary Institute, a NASA-financed research institute in Houston. Even if NASA sits on the sidelines, traffic to the moon will be busy. China announced this past week that it would land its first exploratory rover on the moon by the end of the year. India, Japan, Russia and the European Space Agency also have unmanned missions in the works. 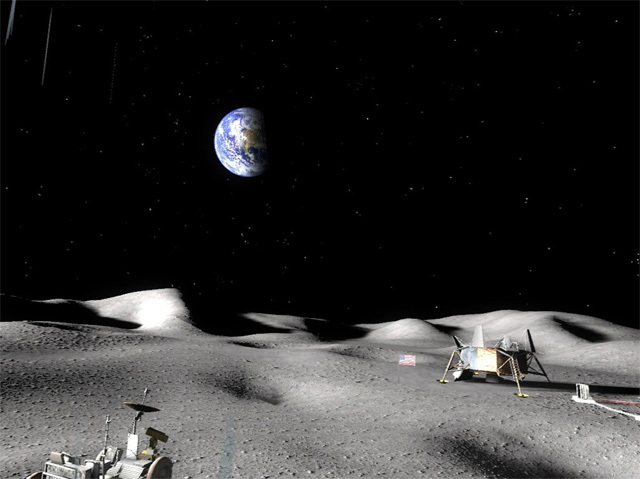 And Google is sponsoring a competition called the Lunar X Prize, offering up to $20 million to the first company that can send a robotic spacecraft to the moon by 2015 and make it perform certain tasks. The LADEE spacecraft was conceived when NASA was also planning new manned missions to the moon, which would have been the first since 1972. But the Obama administration canceled that program, called Constellation, in 2010, calling it over budget and behind schedule. LADEE stayed in the pipeline. The spacecraft will search for water in the very thin lunar atmosphere, which is estimated to be 1/100,000th the density of Earth's, perhaps similar to Mercury's. Scientists want to find out how the ice on the moon's poles managed to get there, said Dr. Richard Elphic, project scientist for the mission. They speculate that water molecules in the moon's atmosphere may have migrated toward the poles and frozen in place, he said. Evidence of water below the moon's surface was discovered in recent years by a NASA-financed instrument aboard an Indian spacecraft, Chandrayaan-1. Data collected from the coming mission could help complete the picture of the moon's water cycle, Elphic said. The orbiter will also examine the movements of lunar dust. "Dust" is a bit of a misnomer, the scientists said: the crushed debris is extremely fine but also has jagged, sharp edges, since there is no wind or water on the moon's surface to wear it down. "It's certainly more annoying than terrestrial dust," said Dr. Sarah Noble, program scientist for the mission. "It's like shards of glass, and it sticks to everything. If it gets into your eyes or your skin, it's abrasive and it hurts. It also really gums up machinery." The dust poses a risk to robots and humans alike, as it can wreak havoc on equipment and spacesuits. Understanding the way the dust moves through the atmosphere will help scientists better prepare for longer missions on the moon, Elphic said. Not everyone agrees that dust is a major concern. "Dust on the lunar surface does not pose a serious risk to future lunar exploration," Kring said, pointing out that astronauts managed to survive the dust without major problems. But he still saw value in the dust inquiry, saying, "We always want to reduce the risk, and to understand the dust phenomenon in and of itself is worthwhile." NASA said the launching would break technological ground. Previously, spacecraft were custom-made for each mission and the models were not reusable. But this spacecraft was designed for assembly-line production, so that future missions could save money by using identical components. The spacecraft's design and construction cost $125 million out of a mission price of $250 million, said Dwayne Brown, a NASA spokesman. If the same design were used again, Brown said, NASA estimates that the cost would drop to $90 million for the first spacecraft and then over time to $55 million each. At the moment, though, NASA does not have other projects lined up to reuse the model, he said. The spacecraft will ride on the maiden voyage of the Minotaur V rocket built by the Orbital Sciences Corp., one of several private contractors NASA has turned to in recent years to supply rockets for its missions. By Caroline Chen, NYT News Service.